The Bills have a 35-year-old retread quarterback who probably has no business wearing an NFL uniform. Their only star player on offense is in the concussion protocol. And their defense laid yet another egg in a shockingly embarrassing 37-5 loss to the Colts on Sunday. That's the backdrop with Tom Brady and the New England Patriots coming to New Era Field in a game that will be out there for a nation to see on Monday Night Football. NFL Nation may want to cover its eyes, or seek entertainment elsewhere. "We got beat, and now we have to get ready with No. 12 coming in next week, so we can't think about it too long," said defensive tackle Star Lotulelei of the impending specter of Brady and company. Not thinking about it too long is a wise decision, because that performance in Indianapolis was beyond abysmal, in many ways more rancid than the 47-3 loss to the Ravens on opening day. They were the playoff-contending Ravens; this was the 1-5 Colts who have an excellent quarterback in Andrew Luck, and not a whole lot else. Derek Anderson, with three practices as a member of the team, started at Lucas Oil Stadium because Bills head coach Sean McDermott really had no choice, given that the alternative was Nathan Peterman. Anderson threw three interceptions and lost a fumble as his career record as a starter dipped to 20-28. "I've got to be very conscientious of the facts," Anderson said. "You know, coach talks about controlling the football and not giving them points. I gave them points before the half and then came right back out in the second half and turned it over again and they get seven points. I've just got to be better with the ball, better awareness. Can't turn the ball over four times and expect to win a football game." Anderson wasn't helped by the fact that LeSean McCoy exited the game after just two plays when he landed on his head while getting upended out of bounds. His status for the Patriots game won't be updated until later in the week, but there's a chance he might miss his second game of the year due to injury. It is almost inconceivable that the Bills will have to play the Patriots with Anderson as the quarterback, and possibly without McCoy. The point spread opened at 13, and it could rise as the week goes on. "Nobody wants to be where we're at," said offensive coordinator Brian Daboll, who spent many years celebrating Patriots victories over the Bills when he was an assistant coach under Bill Belichick. "Everybody is disappointed. Put me at the top of the list. Anytime you have five turnovers in a game, no matter what game you're in, you're not going to have much of a chance to win." As for the defense, the Bills came into the game ranked No. 3 in the NFL in yards allowed per game and per play, eighth against the run, sixth against the pass, and seventh in sacks per pass attempt. So, what happened? The Bills looked like the unit that gave up 75 points to the Ravens and Chargers in the first six quarters, not the group that over the previous 18 quarters had allowed only 63 points. A Colts offense that ranked 30th in the NFL in rushing ran for 220 yards, including 126 by Marlon Mack who started the day with 123 for the season. Luck threw four touchdown passes, and for the first time since McDermott became head coach in 2017, his defense did not record a sack or a turnover. "We couldn't stop anything, we couldn't do anything," said safety Micah Hyde. "Just one of those games that just snowballs and everything got worse. I really don't know, I wish I had information to tell you, but I really don't know until we watch the film to see exactly." The Bills knew Luck would make some plays, especially because he was getting wide receiver T.Y. Hilton back from injury, and sure enough, Hilton caught two touchdown passes. What was so disconcerting is how the Colts pounded the Bills on the ground. 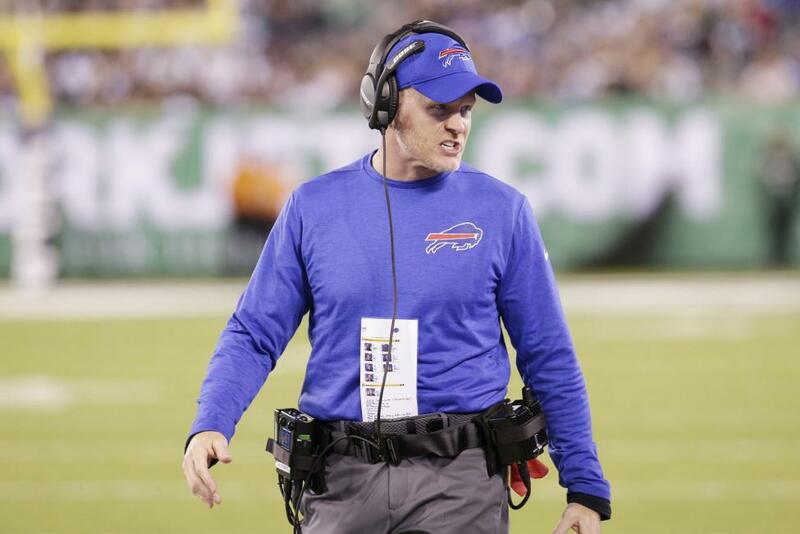 "Run defense comes down to gap integrity and recognizing schemes going on inside and we didn't do a good enough job with that," McDermott said. "And then, when they do run the ball outside, we've got to get support from the linebacker level on the secondary and we didn't get that." The Bills catch a minor break as New England rookie running back Sony Michel probably won't play, but on the flip side, it is expected that tight end Rob Gronkowski will be back after sitting out New England's victory over Chicago. The Patriots rank fourth in the league in points per game at 30.6, and the Bills have scored 81 points all season. It's a mismatch of epic proportions, though most Bills-Patriots games the past 18 years have fallen into that category. Brady can't wait to get to Buffalo. And as he was leaving Solider Field on Sunday night, he let that be known when he recorded a selfie video during which he said, "Another great win; 5-2, gotta get to 6-2. Woo! Bills Mafia, here we come."